You will earn 6,840 Reward Points. Earn 1 reward point for every 1 dollar spent. 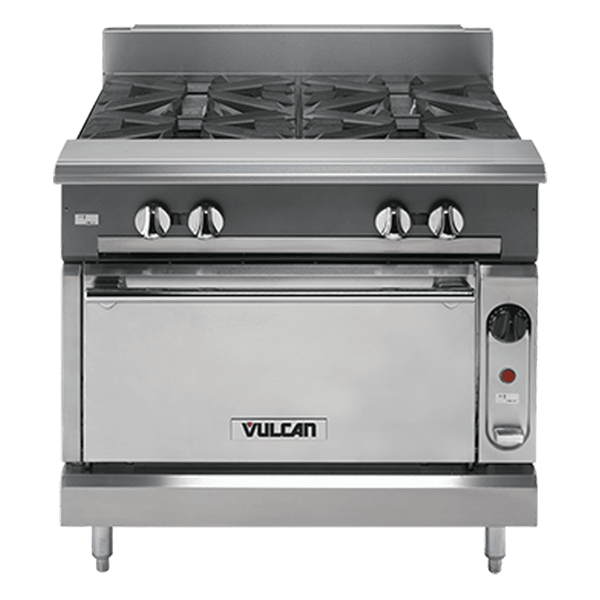 36" wide heavy duty gas range, Vulcan Model No. V2BG18 (modular) and V2BG18B (cabinet base), V2BG18S (standard oven base) or V2BG18C (convection oven base). Modular construction for ease of installation. Stainless steel front, plate ledge, front top ledge with pull-out condiment rails, sides, base, stub back and 6" adjustable legs on all “B”, “S”, & “C” models. Stainless steel extra deep crumb tray. Two 33,000 BTU/hr. cast burners with liftoff burner heads and one 30,000 BTU/hr. griddle burner. Individual pilots and controls for each burner. Heavy duty cast burner grates, easy lift off 11" x 17" in front, 14" x 17" plates in rear. Grates and plates are separate from aeration bowl for ease of cleaning. 18" ground steel griddle plate. Standard Oven: 50,000 BTU/hr. with porcelain oven bottom, sides, and interior door panel. Convection Oven: 32,000 BTU/hr. with porcelain oven bottom, sides, and interior door panel (115v-1 phase blower motor, 4 amps, 9' cord & plug). Ovens measure 27"w x 27"d x 13"h. Standard oven thermostats adjust from 150° – 550°F. Convection oven adjusts from 175° – 550°F and the optional finishing oven for standard ovens adjusts from 300° – 650°F. Standard oven supplied with one rack, convection oven with two. Both ovens allow for three rack positions. Oven door is heavy duty with counter weight door hinges. 1 1⁄4"diameter front manifold and 1 1⁄4" rear gas connection, capped. Total input 60,000 BTU/hr.